I've already discussed my love for the Seche Ridge Filling Base Coat. (Click here for a little refresher course.) 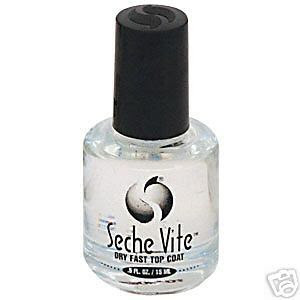 Well, I'm adding another product to the fabulousness of all things Seche ... and its name is Seche Vite. Now, I've tried many a top coat in my day. And while they all claim to make nails dry quickly without any sort of smudging or streaking, there's always something that seems to go wrong. Either they leave tons of pesky little bubbles in my polish, or they don't make the polish any shinier. But this is a true miracle worker that I just can't believe I ever lived without. Each time I swipe this across my polish, my nails dry to a glossy finish within minutes. I'm able to be up and about without any worry of screwing up my freshly polished nails literally by five minutes after I sweep it across the nail! Not only that, it keeps my polish from chipping for up to 10 days. Yes, 10! Isn't that unbelievable? But best of all, it is seriously cheap. A bottle will only set you back $4.25 at 8ty8beauty.com. Have you ever heard of anything more glorious? This is the holy grail of all holy grail beauty products!! I totally agree! Their top coat is my fave product! You do your nails and they're done 2 minutes after you put this on! It rocks!